A month through Asia with hand baggage | About various things! On the cosmetic chapter, another story. I knew that in Asia the humidity was very high, but believe me, that did not stopped me from buying mascaras, foundations and waterproof lips and eye pencils. After making sure the cosmetics kit was complete with makeup brushes, makeup and other stuff, another dilemma created my strong insomnia: should I take my hair plate or the hairdryer? Hard, very hard I decided and granted all the advantages of the hair plate. The strongest of them was the fact that my hair is naturally curled, and at high humidity it wrinkles hard and turns me into a broom with a hair thrown in all directions. The outcome?!? It was terribly hard to carry two trolleys and hand luggage filled with stuff we did not use! The hair plate was totally unnecessary, I could have had the straightest hair in the world, as soon as I was out of the room it was all curled up. I never used my foundation or makeup because it all flowed on me. Jackets, jeans and other clothes stayed in the hotel room in Bangkok, because I bought many bottles of coconut oil on the weekend market and had to place them in my baggage. It was the wisest decision I took. First destination being Laos, we went with Qatar Airways to Bangkok and then Lao Airlines to Luang Prabang. If we had baggage, we would have had to take our visa for Thailand from Bangkok airport. Moreover, through all the airports we reached, we passed very quickly and we did not waste time in the check-in area. But most of all I was glad I had only hand baggage when I reached the beaches of South Cambodia where it was very warm and barely wearing my shirt, I do not know what I would do if I had to run a trolley on the sand even at a distance of 10 meters. So I had to drastically reduce the number of things that I put in my backpack and took with me only the very important stuff I could not have stayed in Asia without or I was not so sure about that I can find them in local shops. Because we did not make any vaccine when we left the country, as soon as we arrived in Laos, we bought mosquito solutions that we used every day. There were a lot of mosquitoes, especially as Luang Prabang is crossed by the Mekong River, and any ride on the waterfront could have had ugly consequences. 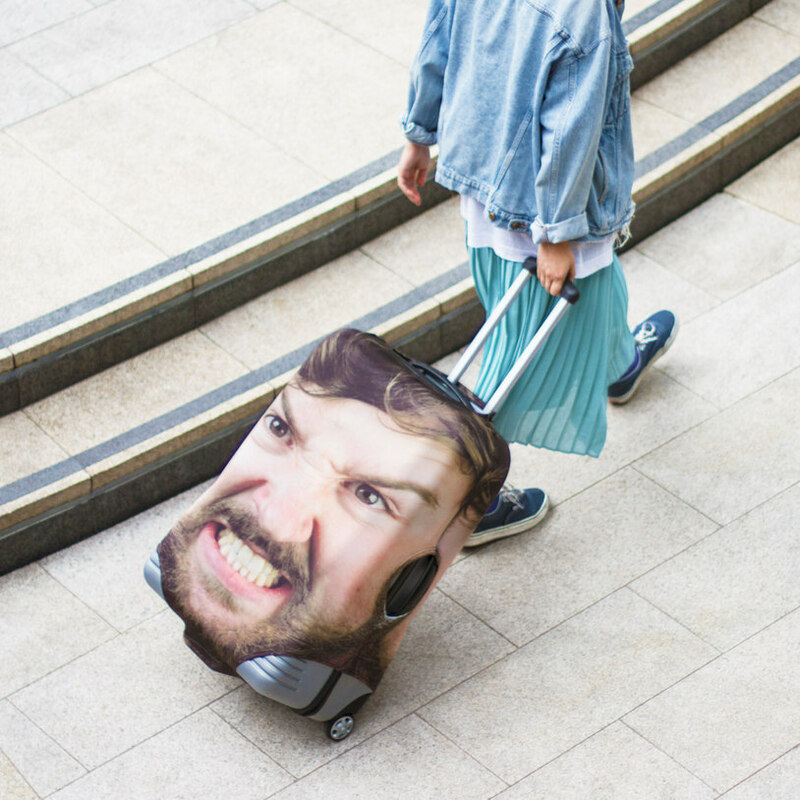 Also searching for various models of trolleys on the internet, I found this copy that can be imprinted with your face, your beloved / girlfriend or whatever goes through your mind. I want to say that to me it seems a funny idea to have a trolley that you can not easily confuse with another and be different. If you are fun enough and print your face on the trolley, recovering your luggage at the airport is not a risk for someone to cry over for having accidentally taken their trolley 🙂 Plus I find it interesting as a gift idea for people who adore to travel 🙂 If you like the idea, find this type of trolley here. With or without luggage, travels are part of our lives. I wish you many beautiful excursions and I would love to know if you would like to cross the world with such a trolley. Dubai, Tenerife, London or Thailand??? Professional hair dryer? Oh, yes !!!! Thanks a lot beautiful lady for taking us with you to enjoy your adventure in Asia. I hope to continue your interesting trip soon. A beautiful cruise in Ha Long Bay | About various things! wow Great! Nice Article. thanks For sharing! That’s one kind of trolley I love. It stands out in the crowd with full expression. I should learn how to pack light! 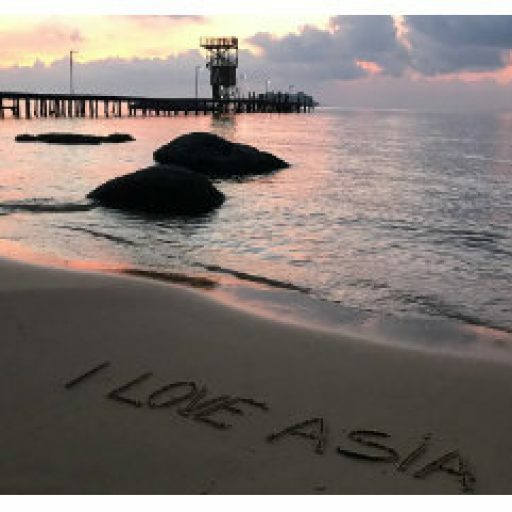 Great post, I hope you enjoyed your trip around Asia! This sounds like a great adventure, darling! Thank you or thanking us there! I hope to visit Asia some day! I never thought of traveling round Asia with just hang luggage. I always been a backpacked kind of girl. It a good idea and something I might do on a traveling stay vacation. wow! 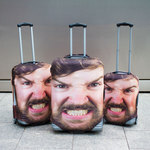 I don’t think i would be able to travel with just hand luggage.